Indian cricket team has launched a new dress. Wearing the same dress team debut in the tri-series in Australia starting on Friday. Since the team's jersey to be discussed but the dress is one other thing that is very discussed. The dress made from plastic bottles are old. 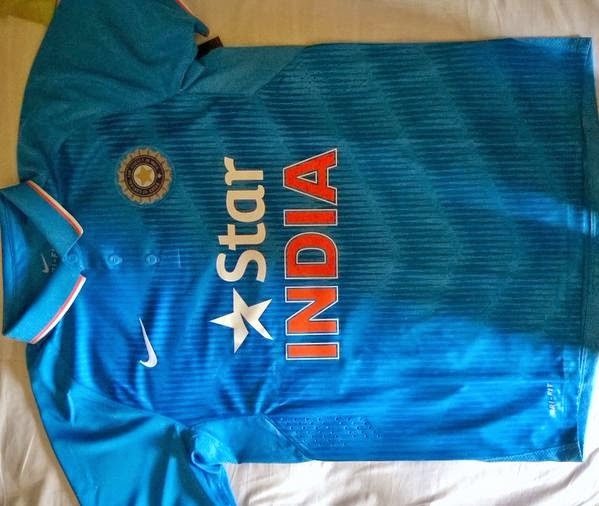 The official sponsor of the team's dress was designed by Nike Team India average of 33 in each kit is designed to recycle the plastic bottles. Nike said about the games that have been designed with the latest designs. India's cricketers on the field before them rhythm and momentum was collected to help the team to their best. Nike Dri-FIT technology to make the kit has been used to control the temperature of the body, it helps more and more players will be able to concentrate on your game. Team India captain Mahendra Singh Dhoni on the sidelines of the launch, "said India's new dress light, comfortable and equipped with new experiments in the field of game players do not care and it is very important to move the match winning innings or is very little difference between the wickets. "" The year 2015 is very important for the team this year, the world's best teams will compete for the world Cup. Team India jersey really symbolizes passion for cricket in our country. "Dhoni, R Ashwin, Ravindra Jadeja, Umesh Yadav and several players, including suggestions for the new dress said. BCCI secretary Sanjay Patel said, "It is more than a jersey. It is the passion of a billion hearts, it is the color that unites the country. We are pleased that the adoption of innovative technologies Nike various sports and her team used their expertise to suit the specific needs of the players to dress up. "